SD-WANs have become very popular because they solve current business challenges while leveraging new SDN, NFV, orchestration and cloud technologies. Enterprises have been building SD-WANs for several years but prefer to have a service provider manage the service for them rather than build and operate it themselves. Service providers are challenged to quickly introduce new SD-WAN managed services due to the lack of standardization of service definitions and architectures. Today, SD-WANs come in all types and flavors. 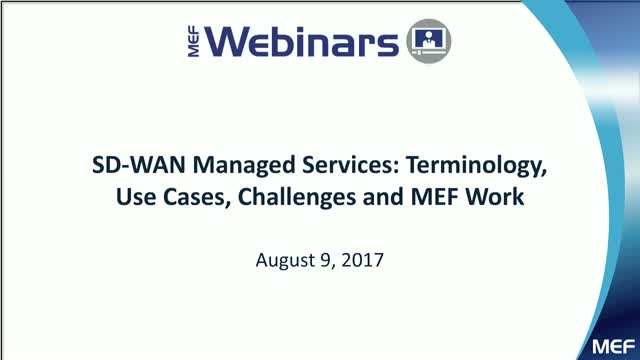 In this webinar, you will learn about the MEF's SD-WAN standardization work and different use cases from the perspective of two SD-WAN managed service providers (MSPs) with different delivery models. The webinar will discuss the market drivers and business benefits for SD-WAN managed services and how MEF standardization of SD-WAN services using the LSO reference architecture could address current operational challenges to accelerate service delivery. SDN and NFV technologies are critical to the success of network and service transformation for communications service providers and enterprises. But the skills necessary to achieve transformation results are scarce. A recent MEF and Vertical Systems Group survey ranked engineering expertise and technical resources as the No. 1 business challenge for migrating to cloud-centric, dynamic network services. Research by SDxCentral, Cartesian, and others have identified SDN and NFV skills shortages as the major barriers to success. MEF's vendor-neutral SDN/NFV professional certification is the only industry accreditation recognizing the technical depth that is required in these technologies to address organizational skills gaps, accelerate transformation initiatives, and ensure competitiveness now and in the future. Is today’s workforce up to the challenge of SDN and NFV? Do you have the skills necessary to plan, deploy and manage virtualized networks? Industry predictions say both SDN and NFV technology adoption is continuing to grow. Not only do revenue-generating services rely on the maturity of SDN / NFV but also the skilled engineers, developers and operators behind the technology. Join in and understand how to “up-skill” your workforce to take full advantage of the SDN and NFV opportunity for agile services growth. Join us for the unveiling of MEF’s higher-level training strategies behind the new MEF-SDN/NFV skills certification. Understand the future of SDN & NFV from luminaries Dan Pitt (VP, MEF), and Vishal Sharma, Principal at Metanoia, Inc., with insight, information, and expert perspectives. In April 2018, MEF introduced its new MEF SDN/NFV professional certification. MEF-SDN/NFV is the first ISO-standard certification exam that validates professionals’ knowledge, skills, and abilities in the domains of software defined networking and network functions virtualization. This vendor-neutral certification empowers individuals with the know-how to plan, build, and operate complex SDN and NFV solutions. Andres Madero-Dir. de Arquitectura, Infinera; Thomas Mandeville-Dir. de Operaciones, Iometrix;Rick Bauer-Director de Cert. En noviembre de 2017, MEF lanzó su nuevo framework MEF 3.0 para definir, entregar y certificar servicios ágiles, asegurados y orquestados en un ecosistema global de redes automatizadas. Decenas de empresas de servicios y tecnología han aceptado el MEF 3.0 y actualmente están involucradas en el trabajo de desarrollo de MEF 3.0. Los servicios de MEF 3.0 buscan proporcionar una experiencia de servicios bajo demanda, centralizados en la nube y que pueden ser controlados por los propios usuarios. Building on the success of its MEF-Carrier Ethernet Certified Professional (MEF-CECP) program, MEF introduced its MEF Network Foundations (MEF-NF) certification in December 2017. MEF-NF helps individuals pursue advance skills to keep pace with rapidly evolving network environments. This new certification validates individuals’ concept-level understanding of key modern networking terms, processes, and elements covering knowledge and practice domains of SDN, NFV, Connectivity Services/Carrier Ethernet, and Lifecycle Service Orchestration. A leading service provider will provide a testimonial on the value of MEF-TN certification and share the business benefits that can be reaped by having a highly skilled workforce. In Nov. 2017, MEF released our MEF 3.0 transformational global services framework for defining, delivering, and certifying agile, assured, and orchestrated services across a global ecosystem of automated networks. Dozens of service and technology firms have publicly embraced MEF 3.0 and currently are involved in MEF 3.0 development work. MEF 3.0 services provide an on-demand, cloud-centric experience with unprecedented user- and application-directed control over network resources and service capabilities. Carrier Ethernet es el combustible para la economía digital global y la base sobre la cual se construye nuevos servicios dinámicos, seguros y orquestados para el mundo hiper_conectado. Pero la falta de estandarización para interconectar proveedores y operadores de servicios Ethernet es un obstáculo para el crecimiento y la eficiencia del mercado. Actualmente, la mayoría de las interconexiones Ethernet son interconexiones de red a red (NNI) no estándar y personalizadas, lo que impide escalar el mercado. Más de una docena de proveedores de servicios y proveedores de tecnología miembros del MEF han participado en el proyecto MEF para crear Puntos de Interconexión Ethernet (Ethernet Interconnect Points o EIP) aprovechando los estándares existentes para interconexión CE. La primera fase del proyecto EIP involucró la creación de una Directriz de Implementación de Punto de Interconexión Ethernet que recomienda cómo usar las Interfaces Estándar de Red a Red (ENNIs) de forma eficaz. Esta guía inicial se enfoca en la configuración de servicios de acceso Ethernet (E-Access) de una manera simple, y las nuevas directrices avanzarán en complejidad con en el tiempo. Las directrices ayudarán a la industria a escalar rápidamente y reducir complejidad. Este webinar explorará dónde se dirige el mercado, las expectativas técnicas, los obstáculos operacionales que pueden surgir y la necesidad de que los operadores gestionen eficazmente la transición a medida que el mercado avanza hacia la estandarización. Este seminario apunta a aquellos proveedores de servicios que compran servicios de Ethernet mayoristas de operadorese interconectan sus redes para crear servicios CE minoristas de extremo a extremo pasando por múltiples redes. También se compartirá informaciones que pueden ser importantes para la toma de decisiones mientras desarrolla su estrategia de cómo sacar total provecho de interconexiones Ethernet estandarizadas. MEF's prestigious annual Awards Program, now in its 12th year, is the world's largest, longest-running awards program. It focuses on leadership in emerging Third Network services powered by LSO (Lifecycle Service Orchestration), NFV, SDN, and CE 2.0 networking technologies. The MEF 2017 Awards program recognizes service, application, technology, and professional excellence in the vibrant global Third Network community committed to delivering innovative solutions that are optimized for the digital economy and the hyper-connected world. The most advanced services typically provide an on-demand experience with user-directed control over service capabilities and are delivered over more automated, virtualized, and interconnected networks. The deadline for submissions is September 13, 2017. Awards finalists will be announced on October 17, 2017. This is an excellent opportunity to have all of your questions answered and will help you to get one step closer to being an award winner. Service Activation Testing (SAT) plays an important role in MEF’s Third Network vision of delivering agile, assured, and orchestrated connectivity services. MEF 48 (SAT), MEF 46 (Latching Loopback) and MEF 49 (SAT Control Protocol and PDU Formats) specifications make up a framework for standardized testing and troubleshooting of Carrier Ethernet-based services for service providers. Collectively these specifications are known as the MEF SAT Power Play. These specifications can be used all together or individually to comprehensively test Carrier Ethernet-based services. The webinar will discuss the important relationship between MEF’s SAT specifications and the work of other standards developing organizations (SDOs), such as IETF RFC 2544 and ITU-T Y.1564. Discover the many benefits of MEF’s SAT Power Play including improved testing efficiency for retail and wholesale Ethernet service deployments, boosting customer satisfaction by reducing the number of faulty turn ups, and accelerating the interconnection process between peer operators. Service assurance encompasses the procedures used to monitor a network service and maintain a particular service quality. Learn how MEF has tackled this topic to enable Service Providers to deliver high-value Carrier Ethernet (CE) services that are fully assured and can deliver the service quality required in today’s competitive business service and carrier-to-carrier markets. This webinar begins with the key business drivers, CE 2.0's performance attributes and best practices for measuring CE 2.0 service performance. With multiple transport technologies, legacy tools, proprietary instrumentation, interoperability challenges as well as other related service assurance standards, these factors conspire making it difficult to understand and leverage best practices. CE 2.0 product owners, network engineering and OSS engineering will benefit from this webinar by better understanding the potential return on investment to be gained from adopting these best practices. Attendees will also learn how to simplify management, accelerate delivery and turn-up of existing services, and new service launches. This webinar discusses considerations for implementing NFV to add new virtual network functions and virtual network services onto foundational Carrier Ethernet (CE) connectivity services. The webinar discusses terminology and use cases for different deployment models for virtual network functions at the customer premises or within the service provider’s data center or central office. The webinar also discusses different business and operational considerations when deploying NFV using Network Interface Devices (NIDs) and vCPE at the customer premises for different network functions and services. To meet the increase in mobile devices and the demand for more bandwidth, as well as high quality of service (QoS) and experience (QoE) for users, operators are deploying new types of infrastructure and technologies, such as Small Cells, carrier-grade Wi-Fi, distributed antenna systems (DAS), and remote radio heads (RHH), among others. These new technologies impose different requirements on the backhaul network in order to achieve better user experience. Therefore, operators must have a clear strategy to improve their current mobile backhaul networks. Mobile backhaul network design may determine the capacity and performance of the mobile network. This webinar will present findings from the first independent study to measure the value of MEF’s Carrier Ethernet Certified Professional (MEF-CECP) certification program. Conducted by Vertical Systems Group, the research study was focused on gaining objective input directly from MEF-CECPs to analyze if and how certification actually impacts job performance, career advancement and company success in the Carrier Ethernet (CE) market. The research study is based on responses from 330 MEF-CECPs from 38 countries worldwide who work for service providers, equipment vendors, software suppliers and other firms. Highlights of the findings include an effectiveness rating of 9 out of 10 for improvements in the typical CE sales process and even higher on order processing flow improvements. In this webinar, two leading service providers with more than 450 MEF-CECPs in their organizations (Level 3 Communications & Charter Communications) will provide testimonials on the value of MEF-CECP certification and share the business benefits that can be reaped by having a highly skilled CE-focused professional work force. This webinar for the CALA region will be held in Spanish with supporting slides in English. A significant transformation is taking place in data communications networks that is accelerating the ability to deliver on-demand services with unprecedented user control over interconnected networks. MEF refers to this transformation and the underlying network that deliver these services as the “Third Network.” The Third Network combines the on-demand agility and ubiquity of the Internet with the performance and security assurances of Carrier Ethernet (CE) 2.0. As the global defining standards development body for Carrier Ethernet for the past 15 years, MEF has accelerated the growth and adoption of CE services through its specifications, service definitions and information models that are agnostic to the underlying transport technology used to deliver them. MEF offers certification programs for CE services, network equipment and individuals. Lifecycle service orchestration (LSO) is a key enabler to deliver Network as a Service as defined in MEF’s Third Network vision. The objective of the Third Network is to provide an on-demand cloud-centric experience with unprecedented levels of user control over the network’s capabilities. Such capabilities are orchestrated between physical and virtual service endpoints across multiple networks and technology domains. This webinar will present MEF CE 2.0 as the foundation upon which to build Third Network services. This webinar will provide a description of retail and wholesale services and also cover the MEF certification programs (professionals, services and equipment). Finally, a brief overview of agile, assured and orchestrated Third Network services powered by CE 2.0, LSO, SDN and NFV will be presented. The industry is moving on from Carrier Ethernet 2.0 to elastic networks, on- demand services and real time provisioning, which is enabling SDN and NFV, and tying this together is orchestration. CE 2.0 is all about transport. But going beyond that, with the Third Network, you need to be able to connect to clouds, where all IT is moving to. Additionally, operators need to generate revenue not only on transport and connectivity, but also by creating new functions that would normally be located at the customer premises – hence network-as-a-service (NaaS). All of this needs to be done quickly in near real time, with full functionality available. Then the industry will be able to offer agile, orchestrated and assured services. Carrier Ethernet is the digital fuel for the global digital economy and the foundation upon which to build new dynamic, assured, and orchestrated services for the hyper-connected world. But a lack of standardization for interconnecting Ethernet service providers and operators is hindering market growth and efficiency. Most Ethernet interconnects today are non-standard, custom-built Network-to-Network Interconnections (NNIs), which impedes market scalability. More than a dozen MEF Member service providers and technology suppliers have participated in the MEF Ethernet Interconnect Points (EIP) project to leverage existing MEF standards for CE interconnection. Phase 1 of the EIP project involved the creation of an Ethernet Interconnect Point Implementation Guideline that recommends how to effectively use standardized Ethernet Network-to-Network Interfaces (ENNIs). This initial guideline focuses on the most basic Ethernet E-Access configuration possible, and new guidelines will advance in complexity over time. The guidelines will help the industry rapidly scale and reduce complexity. This webinar will explore where the market is heading, technical expectations, operational obstacles that may be encountered, and the need for operators to effectively manage the transition as the market moves to standardization. Service providers who buy wholesale Ethernet services from operators and interconnect their networks to create multi-network end-to-end retail CE services should attend this webinar to be better informed to make decisions on their journey towards leveraging standardized interconnections. Jack Pugaczewski, Distinguished Architect at CenturyLink, defines Lifecycle Service Orchestration (LSO) as a framework that allows automation of service fulfillment and assurance and provides a well defined architecture for developing API. The Carrier Ethernet market is evolving from static connectivity services toward dynamic "Third Network" services that provide an on-demand, assured, and secure experience with user-directed control over network resources and cloud connectivity. To assess the impact of this transition, the MEF recently worked with Vertical Systems Group on a new study, "Dynamic ‘Third Network’ Connectivity Services Enabled By LSO, SDN & NFV", that involved a global survey of service providers, technology vendors, and other industry professionals. -The role and relative importance that LSO, SDN & NFV will play alongside CE 2.0 in driving the market forward. An industry association of 200+ member companies, MEF is the driving force enabling agile, assured, and orchestrated communication services that empower users with the dynamic performance and security required to thrive in the digital economy.